I'll get to my title later on. First I have some cards to share with you!! I have been starting most of my post's with Chrismas cards these days...so today I am going with a non-Christmas card! No worries...there are two that are Christmas themed. And considering it is rainbow themed.....so love it!! It is based on this week's sketch at Get Sketchy, GS#18. Such a fun sketch to play with...be sure to check it out!! Card Instructions: Cover the front of a white cardbase with red dotted paper and round the bottom corners. Round the bottom corners of a block of white cardstock and adhere to the middle. Punch an apron lace border to a strip of yellow dotted paper and adhere to the front. 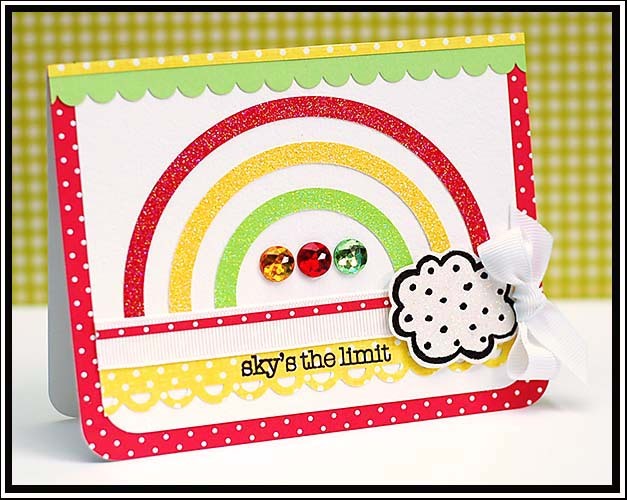 Cut three rings from glittered cardstock and arrange in the shape of a rainbow to the front. Adhere a strip of white grosgrain ribbon to the top of the yellow paper and top with a thin strip of red dotted paper. Stamp the cloud on white glittered cardstock and cut out. Adhere with foam adhesive to the right side of the rainbow. Add a bow to the right hand side of the cloud. Stamp the sentiment below the ribbon using black pigment ink. Add green paper frill and a thin strip of yellow dotted paper to the top of the card. Accent the middle of the rainbow with jewels. Up next is my card based on Laura's Sketch 41 at the 2 Sketches 4 U blog. I LOVE this sketch....I had an idea right away for it. This is what I came up with! Card Instructions: Fold kraft cardstock in half to make your cardbase and round the right hand corners. Add a thin strip of striped paper to the left side. Using the Cuttlebug and Winter folder, emboss a border right next to the striped paper. Add the rub-on sentiment to the lower right corner of the card. 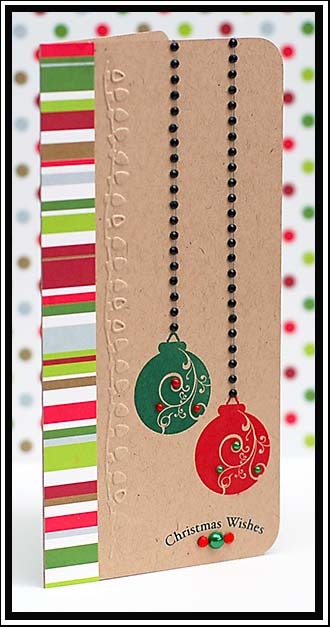 Stamp the ornaments in cranberry and evergreen pigment ink above the sentiment. Accent the card with jewels and pearls. And last, but definitely not least, is my card for CPS 146 this week! Fun sketch this week...be sure to come and play along if you have the chance!! Card Instructions: Cover the front of a white cardbase with pink and striped patterned papers. Add a block of pink cardstock and a scallop strip to the left hand side. 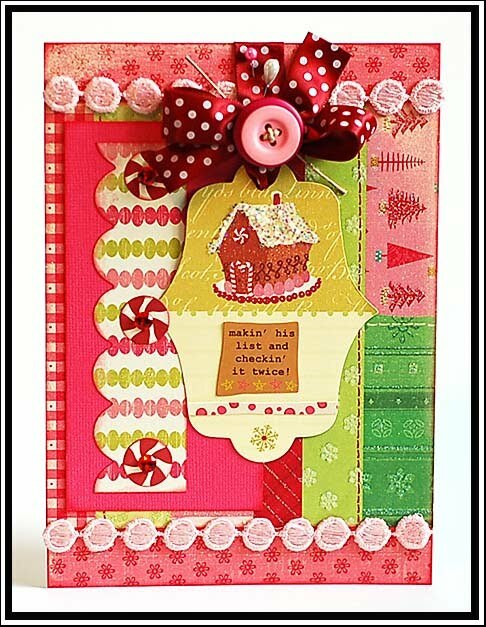 Add the pink circle trim to the top and bottom of the card. Cover the top of the house with glitter, and adhere the tag to the front using ribbon and top with a bow. Accent the bow with buttons, twine, and pins. Add the stickers to the middle of the tag, and accent the left side with diecut peppermints and jewels. Oh my gosh....it is SO good. I am almost out of it, so I am going to have to find it as well. Josh's parents sent us this last Christmas, and I never made any until this year. So, here is the trick. Get the cocoa all stirred together when the water is piping hot. But then let it sit for a few minutes. This makes the candy cane pieces melt completely. Then stir it again, and enjoy. 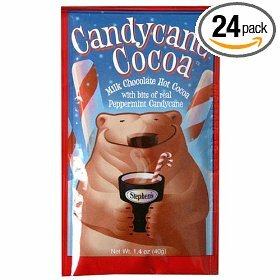 It is so yummy...and letting the candy cane chunks melt make it even more pepperminty!! ♥ it!! So, I am going to leave you with this video today. It is SO hilarious! Love that Taylor Lautner can make fun of the Twilight Saga, and still enjoy being part of it. PS: I know you are probably sick of me talking about my new turquoise washer and dryer! But I have one more thing to say about it. I put the washer to the test this week...and washed my two white coats: a North Face fleece and down jacket. I think they are now whiter than when I purchased them. Love this set! I totally recommend Electrolux if you are in need of a new set!! Okay- bye now! absolutely swoooooning over here lea! you had me at rainbow! where o where to find that hot chocolate now....sigh, i'm on a mission. love to YOU! Fabulous creations, every one of them. LOVING the rainbow and YUM on the hot chocolate. OMGoodness...I absolutely adore your cards...your Get Sketchy cards is over the top magnificent! Fabulous work!! Your cards are so festive:) Thanks for playing at 2S4Y! Lea, I LOVE your style! I'm such a fan! Thanks for playing with 2S4Y! Oh my goodness such fabulous creations! Thanks for playing at Get Sketchy! Your cards are fab as always!!! Love the rainbow card!!!! So glad you got your things....hopefully all in one piece!!! These are so fun and bright and colourful, I love them! Beautiful cards and love the GS one! Yor creations are really pretty!! Thanks for your sweet comment on my blog. Wonderful..!!!!! Love the colors and everything!!! You are awesome..! Also wishing you and your loved ones a blessed festive season. Lea, your cards are rocking my world... the white the bright colors! Perfection! I finally got to come back and watch that video - really so funny. I love when Taylor says he should get an Oscar. Love your cards as always! Stuning!!! Your design and colours are stunning, such a sweet imate and wonderful details.